The considerable potential for energy harvesting in the field of medical implants — where the body itself could become the energy source — means the efforts to enable ultra-low power circuits and sensors to exploit energy harvesting are accelerating, enabling autonomous operation and battery-free design to be realised. By Rich Miron, Technical Content Team, Digi-Key. Significant advances in extremely low power, ultra-miniature electronics, including RF circuitry and wireless sensors, is generating strong interest in energy harvesting for medical implants. When batteries can be eliminated, or their life extended significantly, then implants will become smaller, more convenient, more reliable and longer lasting. Cardiac pacemakers, powered by piezoelectric energy harvested from the heartbeat itself are now viable. A European consortium of researchers, led by CEA-Leti in France, is developing a low power cardiac pacemaker powered by energy generated by the patient’s heart beats. Eliminating the battery avoids having to replace it periodically and reduces the total device size (Figure 1). The team is aiming to reduce the size of the cardiac stimulator to less than 1cm3, enabling it to be implanted directly onto the epicardium. The consortium is investigating both piezoelectric and electrostatic (electrets) techniques for the mechanical to electrical conversion process. Initially, the techniques are expected to provide an output power of around 10µW. In the US, researchers at the Department of Aerospace Engineering at the University of Michigan are testing a piezoelectric energy harvesting device with the potential of using the beating heart to generate enough electricity to power a pacemaker. 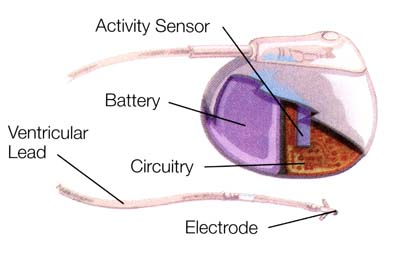 The device is about half the size of the batteries currently used in pacemakers (Figure 2). Trials have shown that it can generate around 10µW of power, around eight to ten times more than is required by modern pacemakers. Cochlear implants, reported to be more effective than traditional hearing aids, have been available for a few years. However, they typically comprise an internal and external section, with the microphone, sound processor and battery in the external unit. The battery remains a limiting factor, particularly as processors become more powerful and computations made more complex. Research into more highly integrated devices is underway. Work at the University of Utah, for example, has demonstrated a proof of concept of implanting the microphone in the middle ear. This is claimed to partly remove the need for an outer hearing aid. However, the battery still has to be recharged at night by wearing a charger behind the ear. Elsewhere, researchers are investigating converting chemical energy in the inner ear to power cochlear implants. A team of researchers led by a group from Massachusetts Institute of Technology is working on harnessing the inner ear’s biological battery, located in the cochlea. The level of electrical voltage is too low however, even to power today’s ultra-low power circuitry. Work still has to be done on storing the charge generated and the power management circuitry, but once operational, the device would be self-sustaining, the researchers claim. Engineers at MIT are also developing glucose fuel cells to power neural implants. The fuel cell operates by stripping electrons from glucose molecules to create a small electric current. The fuel cell can be integrated, together with ultra-low power circuitry, onto a silicon chip, to enable entirely self powered devices such as brain implants. Such implants are being developed to help people with spinal cord injuries or who have suffered strokes. Advances in neuromodulation have resulted in implants that influence the nervous system to control pain, and can help eliminate the tremor in patients suffering from Parkinson’s disease. Ingestible electronic devices, through energy harvesting and/or the use of tiny solid-state batteries, can perform a number of tasks. 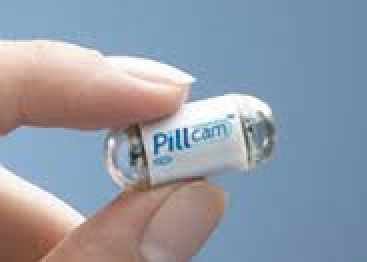 The ‘Pillcam’, the size of a large vitamin capsule, is used like an endoscope to visualise the digestive system, detecting abnormalities as it passes through, thereby avoiding subjecting the patient to lengthy and uncomfortable procedures. Targeted drug delivery for certain types of cancerous tumours is another important application for ingestible implantable devices. The ability to direct an active device to a precise location, to minimise the amount of drug administered and to avoid damaging adjacent cells, is proving particularly efficacious. Exploiting body heat to power electronic devices is an obvious candidate for energy harvesting. For medical implants the challenge is to generate energy internally. Chip-based thermoelectric generators (TEGs) are now envisioned that can be inserted under the skin, or in the skull, for example, exploiting the small temperature differences between the brain and skin tissue. RF technology can also be used to power implants. Radio and electromagnetic signals sent to a small coil in an implantable device can produce enough current for it to operate. Ongoing research anticipates tiny devices that can be injected directly into the bloodstream and wirelessly propelled via an external magnetic field to the correct location, and then powered up to perform specific tasks. Measurement Specialties is a well-established supplier of piezoelectric film sensors to the OEM medical marketplace for a range of applications. Custom components are manufactured in ISO13485 certified facilities in order to meet medical-specific quality requirements. Pressure, force, temperature, humidity and position sensors are incorporated into a range of patient monitoring and treatment equipment. The LDT-028K piezoelectric film transducer is a multi-purpose device for vibration sensing. The piezo film element produces a usable electrical signal output when forces are applied to the sensing area. The dual wire lead attached to the sensor allows a circuit or monitoring device to process the signal. An evaluation kit is available that demonstrates the use of these devices, as well as other Measurement Specialties sensors, for experimentation and development of a range of medical and non-medical applications. In some applications, the next best thing to battery-free operation is to use energy harvesting techniques with a rechargeable form of energy storage. The EnerChip thin film, solid-state batteries from Cymbet Corporation are fabricated on a silicon wafer using semiconductor process techniques. This means that the bare die can be integrated and packaged with conventional circuitry to save both space and cost. In this form, these batteries are up to one hundred times smaller than a non-rechargeable coin cell and last three times longer. Packaged parts, ten times smaller than a coin cell, are also available, with or without charge control and power management functionality. The CBC050-M8C, for example, is rated for 50µAh at 3.8V and is an ideal onboard power source for very low power circuitry and smart sensors. It can be recharged thousands of times and can be coupled to energy harvesting devices. The EnerChip parts have been demonstrated as biocompatible for implantable devices. To experiment with these innovative batteries, the CBC-EVAL-05B EnerChip evaluation kit is available, supplied with a selection of batteries that can be connected in various ways. A universal energy harvesting evaluation kit, the CBC-EVAL-09, accepts inputs from piezoelectric, TEG or electromagnetic power sources, and features the EnerChip batteries. Ultra-low power RF transceivers are critical for implantable energy harvesting-based sensors to communicate vital information. The Texas Instruments CC1101 low power, sub-1GHz RF transceiver, is one example. Primarily intended for the ISM (Industrial, Scientific and Medical) and SRD (Short Range Device) frequency bands, it can easily be programmed to specific frequencies, such as the 400 to 406MHz range, normally allocated for communication between implantable devices and external equipment. The RF transceiver is integrated with a configurable baseband modem. In a typical system, the CC1101 is used in conjunction with an ultra-low power microcontroller, such as TI’s MSP430. For ultra-low power, battery and energy harvesting applications, it can be used with the TPS62730 step down converter with bypass mode. The RF, processing and sensor technology used in medical implants is evolving fast, becoming smaller, smarter and requiring much lower power. As a direct result, energy harvesting techniques are becoming more viable, enabling longer lasting and more versatile, battery-free implants. Energy sources derived from the body itself include piezoelectric (vibration), chemical and heat differential. 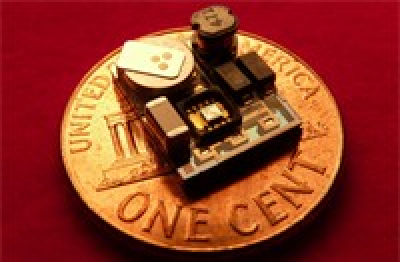 For some short-term implantable devices, external energy sources such as RF power can be used.